There are a lot of strategies for tracking and following up on abandoned carts. This guide will provide an overview of how to set up a basic abandoned cart tracking workflow for Infusionsoft. First, log into Infusionsoft and create a new tag for tracking abandoned carts. Then go to the Addons tab under the WP Fusion settings and begin typing the tag name. If the tag doesn’t appear in the dropdown, click the Resynchonize link that appears. WP Fusion will automatically apply this tag to the user when checkout is begun, and the tag will be removed if checkout is completed successfully. You can also configure tracking tags on a per product basis by going to the product edit screen in either WooCommerce or Easy Digital Downloads. Next, log into your Infusionsoft account and create a new campaign. 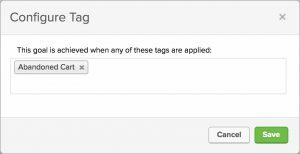 Add an “Applies a Tag” goal and select the tag you created earlier. Then attach a new sequence to this goal. In this sequence, add a Delay Timer, like in the image below. Create two additional sequences behind this one. When you connect the the second sequence to the “Wait” sequence, a decision diamond should appear like in the image below. Finally, in the Customer Abandoned Cart sequence, add any emails or further actions you’d like to happen when a customer’s cart was abandoned. 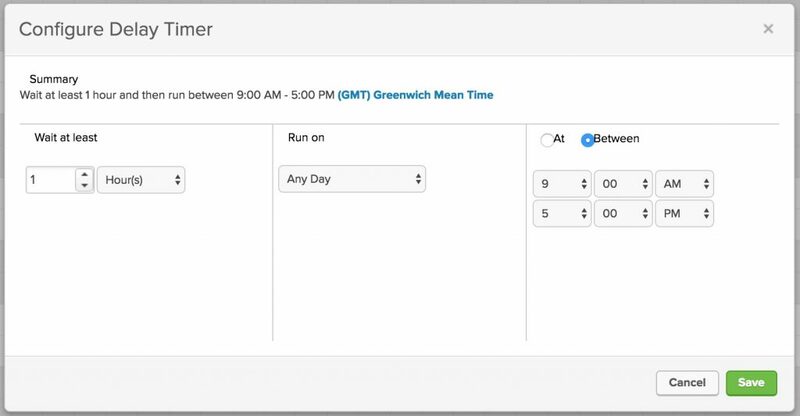 Using this simple sequence you can send an email to customers who added products to their cart but didn’t check out within one hour. By configuring tags on a per product basis, and using more advanced logic rules, you can create highly personalized followup emails based on the specific products that were in the user’s cart.